Al Hill was a versatile depth forward for the Philadelphia Flyers. Primarily a checking forward, he could play wing or center and could be plugged into any line without looking out of place. He was reliable in his own of the ice, took the body willingly, dropped the gloves when necessary and could chip in the occasional clutch goal. The lanky Nanaimo, British Columbia native was a respectable, but far from dominating goal scorer in junior hockey and the American Hockey League. He spent portions of seven seasons with the Flyers from the mid-1970s to the mid-1980s, including three uninterrupted campaigns with the big club. In Hill’s 221-game NHL career, he had a modest 40 goals and 95 points. But for one magical night, he was the best player in the NHL. The game, played on February 14, 1977 against the St. Louis Blues, also happened to be the player’s NHL debut. Hill’s five-point performance in his first game set an NHL record that still stands today. In fact, Hill nearly had a double “Gordie Howe Hat Trick” in his debut: two goals, three assists, and one fight. The 21-year-old undrafted Victoria Cougars graduate was invited to the Flyers 1976-77 training camp as a non-roster player. The rookie free agent impressed the Flyers’ staff with his fundamentally sound play and hustle and was signed to a contract. Hill started the season in the AHL with the Springfield Indians and carried on at a steady, if unspectacular pace. In February of 1977, Philadelphia was beset with injuries on the big club. Among others, both All-Star left winger Bill Barber and right wing Paul Holmgren were out of the lineup. The Flyers reached down to their farm system for help. Hill learned of his call-up on the same day he made his NHL debut. Incredibly, he nearly missed his date with destiny. When he finally arrived in Philadelphia, Hill learned that he’d not only be in the lineup, he’d also be skating on the game’s first shift, along with team captain Bobby Clarke and Bob “the Hound” Kelly. Today, Hill claims “the Fog” was merely working the press for the sake of good copy. The coach knew full well the rookie was on his roster. “One thing about Fred Shero was that he liked to send new players out to start the game. The idea was to get them involved right off the bat. I remember that I was pretty nervous before the game. To go out there right away definitely helped,” Hill says. It didn’t take Hill long after the drop of the opening faceoff to reward the Flyers. Just 36 seconds after the opening faceoff, the rookie gave the Flyers a 1-0 lead. Hill struck pay dirt moments after he, Clarke and Kelly gained the blue line on the rush. Hill took a feed from Kelly and ripped a 40-foot slap shot past Blues goaltender Yves Belanger. Defenseman Terry Murray earned the secondary assist. Midway through the first period St. Louis forward Red Berenson beat Wayne Stephenson to tie the game. Less than a minute later, at the 11:33 mark, Hill struck again. Now playing on the second line with Rick MacLeish and Gary Dornhoefer, Hill and his temporary linemates all registered points as Hill followed up a Dornhoefer shot attempt for his second goal of the game. 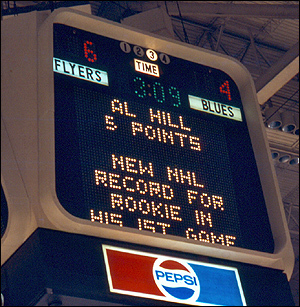 The 2-1 lead held until the 17:00 mark when Hill, now skating with Clarke and Reggie Leach, was instrumental in helping the Flyers expand the advantage to 3-1. As Joe Watson sent the puck in deep, Hill gained control and skated around behind the net. He then fed an open Leach, who took care of the rest. The Blues changed goaltenders at the start of the second period. Out came Belanger and in went 41-year-old Eddie Johnston. The first few minutes of the period were uneventful, until Hill hit the ice near the six-minute mark. If he didn’t already have the Blues attention with three points to his credit, Hill really let his presence be known as he battled in the corner with Bob MacMillan, the Blues’ leading playmaker and top point-getter. Hill was by no means a top-notch or prolific fighter. MacMillan was not known as a fighter at all (that season, he had a mere 11 penalty minutes in 80 games and never reached even the 50 penalty minute mark in any NHL season). But as soon as the players jostled and then locked eyes, the inevitable happened. The gloves came off immediately. “I’d been in that situation enough times to know there’s no sense waiting around,” recalls Hill, who usually hovered around 125 penalty minutes per season during his AHL campaigns and logged 227 total in his NHL career. Coincidentally or not, it took the Flyers just 33 seconds after the Hill-MacMillan fight to extend the lead to 4-1 on a Bob Dailey blast from the point. At the 14:19 mark, the Flyers put the game out of reach. This time, Hill found himself on the right wing of a double-shifting Clarke and Mel Bridgman. The rookie simply chipped the puck to Clarke, who set up sophomore forward Bridgman for Philly’s fifth goal of the game. St. Louis got a goal back shortly after the Bridgman goal, but Hill and his teammates doused any hopes of a comeback in the opening minute of the final period. As he did for the first shift of the game, Shero sent Hill out with Clarke and Kelly. The trio went to work in the offensive zone and Hill earned the primary assist on Clarke’s 21st goal of the season to make it a 6-2 game. Although the Blues scored a pair of goals in the latter stages of the third period to narrow the score to 6-4, the outcome had long since been decided. Hill was named the game’s first star and earned a hearty ovation from the 17,077 fans in attendance. After the game was over, reporters clamored to speak to the previously unknown rookie. It took NHL officials several days of research to confirm that Hill’s first-game performance was, in fact, a feat that had never before been accomplished and would be recognized in the NHL record books. By that time, Hill had played three more games with the Flyers without registering a point, and had already been returned to the AHL. Hill earned a second recall to the Flyers a few weeks later, getting into nine games in all. He had one additional point (an assist) to his credit. 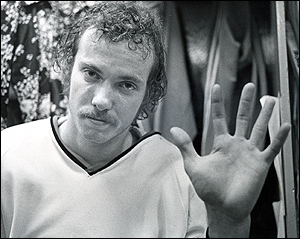 The next season, 1977-78, Hill had a three-game cup of coffee with the big club and then spent much of 1978-79 season in the AHL with the Maine Mariners before finishing the campaign with the Flyers. Hill’s biggest break came in 1979-80: the year of the Flyers’ historic 35-game unbeaten streak. He was a semi-regular in the Flyers lineup, under the auspices of his former Maine head coach Pat Quinn. That year, Hill scratched out an NHL career-high 16 goals and 26 points in 61 games spent mostly on the third and fourth lines. He added eight playoff points to the Flyers march to the Stanley Cup Finals against the New York Islanders. The player then spent the next two full seasons with the big club, tallying 10 goals in 57 games in 1980-81 and 6 goals in 41 matches the following year. When Quinn was fired and replaced with Bob McCammon, Hill’s time with the big club was numbered. He returned to the AHL, spending most of the remainder of his active career with the Hershey Bears. Hill dressed for seven regular season NHL games and nine playoff tilts for the Mike Keenan-led 1986-87 Flyers club that reached the seventh game of the Stanley Cup Finals. The following year, he saw 12 regular-season games with the Flyers plus one playoff appearance in the Flyers’ first-round loss to Washington. At the age of 34, Hill retired as an active player after the 1988-89 season. He immediately accepted an assistant coaching position with Hershey. Subsequently, he was hired by the New York Rangers organization and spent the next three-plus seasons as an assistant coach with Binghamton and an NHL assistant for part of one season. Hill was appointed as Binghamton’s head coach in 1993-94 and spent two seasons at that post. Binghamton let Hill go after the 1994-95 season, despite posting a winning record and reaching the second round of the Calder Cup playoffs. He went on to coach in the International Hockey League and United Hockey League before turning his attention to scouting. Hill, who will turn 53 on April 22, has spent most of the last decade working in scouting. Today, the hockey lifer is a pro scout for the Flyers. Whenever his NHL career is remembered, people inevitably ask him about that night.